Nick Payne’s hotly anticipated play Incognito has attracted four and five star reviews in the British press after premiering at the High Tide Festival earlier this month. Incognito is currently completing a run at Theatre Live Newcastle (who co-produced the play with nabokov) until 3rd May, before transferring to North Wall Arts Centre in Oxford and then to the Bush Theatre in London from the 14th May to 21st June. Combining fact and fiction, fantasy and reality into a single piece inevitably introduces ambiguities for an audience. As a preface to the text of Incognito, Nick Payne writes “despite being based, albeit very loosely, on several true stories, this play is a work of fiction.” Thomas Stolz Harvey, the pathologist who removed Einstein’s brain in 1955 certainly lived, as did many of the other characters in Incognito. Other parts are fictionalised versions of real people such as Henry M who developed amnesia after surgery for epilepsy in the mid 20th century. And many of the characters are simply conjured by Payne, enabling him to weave together multiple engaging human tales. 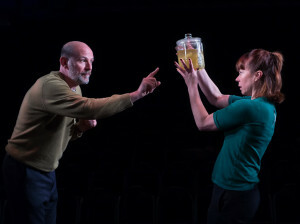 It takes some feat of acting to convincingly bring to life over 20 distinct characters without overlap but Paul Hickey, Amelia Lowdel, Alison O’Donnell and Sargon Yelda achieve it admirably, switching between accents and postures in the blink of an eye. Joe Murphy’s direction seems to employ an almost clinical precision in the movement. Yelda’s range is particularly broad, evoking empathy and disgust for his characters in short order. The range of ideas addressed in Incognito is equally broad, from the spontaneous emergent order displayed by a flock of starlings to concepts in mental health, medical ethics, establishing a sense of family and belonging and personal identity. There is a lot to unpack in this play, which is all bundled up in the history of science, pseudo-history and pure dramatisation. But it’s certainly worth a look because once again Nick Payne intrigues and inspires with a complex new work.